Since 2000 Salumificio Pedrazzoli has been a member of ASSICA (the industrial meat association), which is a branch of Confindustria, the General Confederation of Italian Industry.Nationally and internationally renowned designations and consortia: it is a member of the Consorzio del Salame Mantovano, it has PDO status for Parma Ham, San Daniele Ham and Salamini Italiani alla Cacciatora, and is registered in the Prontuario dei Celiac, the official AIC coeliac handbook. 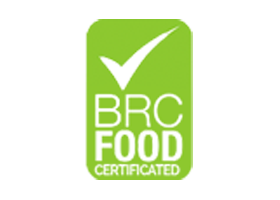 Finally, it is also a registered member and subsidiary of the Consorzio Controllo Prodotti Biologici (regulatory consortium for organic produce). In 1996, Salumificio Pedrazzoli obtained certification as an organic company from Istituto Consorzio Controllo Prodotti Biologici, the Regulatory consortium for organic produce in Bologna. In 2007 it obtained authorisation from the Istituto Nord Est Qualità to produce Salamini Italiani alla Cacciatora PDO. Salumificio Pedrazzoli pays particular attention to how it processes its products and to how closely they reflect market demands. For this reason, the company – and many of its products – is registered in the Prontuario dei Celiaci, the official AIC coeliac handbook. 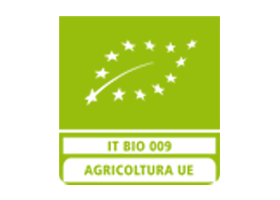 In 1996, Salumificio Pedrazzoli was certified as a regulated organic company by the Istituto Consorzio Controllo Prodotti Biologici (Bologna’s regulatory consortium for organic produce). This regulatory and certifying body is recognised by the Italian Ministry for Agriculture and Forestry. Salumificio Pedrazzoli pays particular attention to how it processes its products and to how closely they reflect market demands. 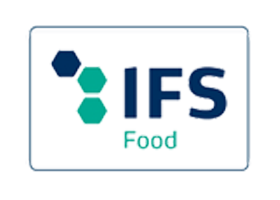 This has led to the development of products – in both Linea Tradizionale and Linea Bio (our traditional and organic ranges, respectively) – for coeliacs. This is why the company is registered in the Prontuario dei Celiaci, the official AIC handbook for coeliacs. At Biofach 1998, the German trade fair, Salumificio Pedrazzoli obtained the prize for innovation for its organically farmed Prosciutto di Parma. Moreover, in 2010, Elisa Pedrazzoli won the young entrepreneur’s award (Premio Giovane Imprenditore) at the 2010 corporate environmental awards (Premio Impresa Ambiente). This prize is reserved for business owners or managers under the age of 40. Elisa won the award for the following reasons: her managerial skills, her dedication and, above all, her commitment to research and innovation in developing environmentally sustainable business practices. Our most recent major recognition came in 2016, for those who, like Salumificio Pedrazzoli, have always worked to maintain the quality of life and wellbeing of their own pigs. 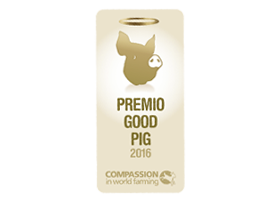 Indeed, Salumificio Pedrazzoli was awarded the prestigious Good Pig Award by Compassion in World Farming.